Tandem Chillers Inc. manufactures both remove for service chillers and service in place chillers both where individual components can be replaced without shutting down the balance of the system – all in the space of a few hours. Outdoor Air Cooled VX Series are now AHRI Certified. Our modular chillers are ideal for those situations where accessibility and space are restricted, expansion is inevitable, where large cooling capacities and uninterrupted operation are required. Possible applications include: large homes or estates, old historical buildings, hospitals, universities, central telecommunication switching centres, computer rooms and data centres, commercial facilities, laboratory environments and industrial process control stations. 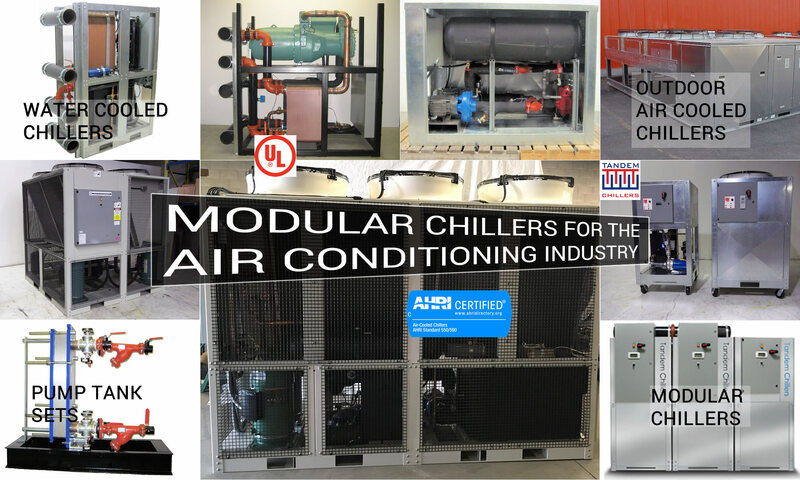 To help you decide if a modular chiller is the right solution for your particular situation please read our article on Air Conditioning Systems Using Modular Chillers. Like all chillers, our models use water, glycol or air as a heat transfer medium. They are different from most chillers in that they were specifically designed for buildings that require extremely large cooling capacities and where space is limited and very hard to access. Providing air conditioning for high rises or old historical buildings with elevators and narrow hall ways present unique challenges. In most cases, with space and accessibility being what they are, you will not want to face the possibility of having to replace or repair the chiller once it has been installed. If it is an older building or a multi-story building with virtually no elevators to speak of, a modular chiller is going to make your life much easier. Capacity: AHRI certifed to 550/590. Electrical: CAN/CSA C22.2 No. 236-11 / UL 1995 4th Edition. Evaporator & Condenser: CAN/CSA C22.2 No. 140-3 / UL 207 7th Edition. A modular chiller system is basically a series or set of modules that operate together to achieve the large cooling capacity required and are installed one at a time. But the true value of a modular chiller solution is uninterrupted operation, this has been achieved by using a systems of modules where it is possible to remove, service or replace individual modules without shutting down the balance of the system – all in a matter of hours. Tandem Chillers is the only manufacturer to pursue this alternative, a true plug and play modular chiller where it is possible to “pull” a defective component to fix it and then “plug” it back into the system without shutting down the system. 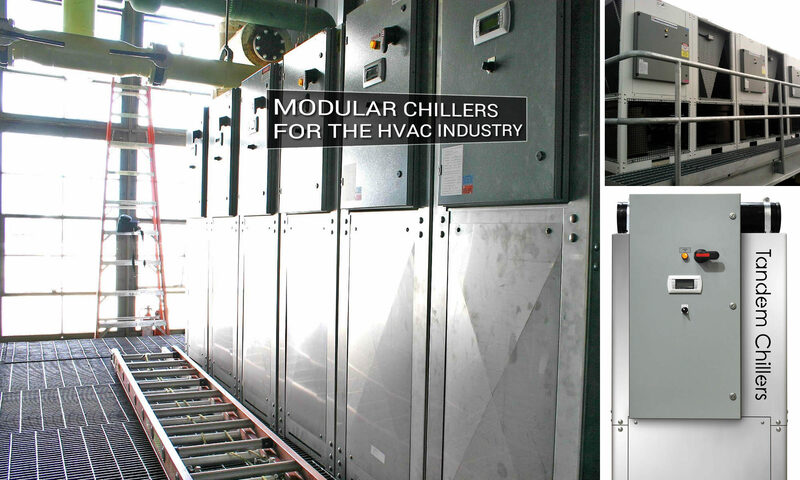 “A History of Modular Chillers“. Since we only use North American manufactured components: Copeland and Bitzer compressors and Sporlan refrigeration products in the production of Tandem Chillers, all major parts can be sourced from local wholesalers or overnight from our facility in Toronto, Canada. Click here for standard features. Visit our parent website, Temperature Corporation where we have built a world wide reputation for manufacturing chillers and chilling systems for the plastic, chemical, rubber, metal working, plating, die casting, chemical, printing, petrochemical, petroleum, pharmaceutical and beverage industries. We have agents located throughout the United States, Latin America and Canada. If you are interested in being an agent for our modular chillers please contact us today.